When we look at the New Testament as history, we need to compare it with other contemporary histories. The best example we have are the works of Josephus. Most Christians have only a superficial knowledge, usually focusing on what Josephus says about Jesus. However, there is much more value to Josephus. 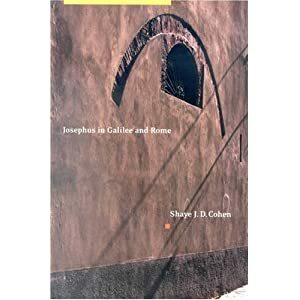 Shaye Cohen in his book Josephus in Galilee and Rome provides a great introduction to historical issues surrounding Josephus. Considering it is a revised Ph.D. dissertation, it is remarkably readable. One of the values of this book is the comparison between Josephus’ first work, War, and his later work Antiquities/Life. The differences between the overlapping sections are quite interesting. This is a key book for the paper I am working on for the Evangelical Theological Society meeting in November.